A recent report published by Infinium Global Research on fuel management system market provides in depth analysis of segments and sub-segments in global as well as regional fuel management system market. The report is a comprehensive presentation of trends, forecast and dollar values of global fuel management system market. According to report the global fuel management system market is projected to grow at a CAGR of 6.3% over the forecast period of 2018-2024. A recent report published by Infinium Global Research on smart mining market provides in-depth analysis of segments and sub-segments in global as well as regional smart mining market. The report is a comprehensive presentation of trends, forecast and dollar values of global smart mining market. According to the report, the global smart mining market is projected to grow at a CAGR of 9.2% over the forecast period of 2018-2024. A recent report published by Infinium Global Research on battery recycling market provides in depth analysis of segments and sub-segments in global as well as regional battery recycling market. The report is a comprehensive presentation of trends, forecast and dollar values of global battery recycling market. According to report the global battery recycling market is projected to grow at a CAGR of 9.0% over the forecast period of 2018-2024. A recent report published by Infinium Global Research on geothermal energy market provides in depth analysis of segments and sub-segments in global as well as regional geothermal energy market. The report is a comprehensive presentation of trends, forecast and dollar values of global geothermal energy market. According to report the global geothermal energy market is projected to grow at a CAGR of 12.2% over the forecast period of 2018-2024. A recent report published by Infinium Global Research on HVDC converter station market provides in depth analysis of segments and sub-segments in global as well as regional HVDC converter station market. The report is a comprehensive presentation of trends, forecast and dollar values of global HVDC converter station market. According to report the global HVDC converter station market is projected to grow at a CAGR of 8.0% over the forecast period of 2018-2024. A recent report published by Infinium Global Research on infrared sensor market provides in depth analysis of segments and sub-segments in global as well as regional infrared sensor market. The report is a comprehensive presentation of trends, forecast and dollar values of global infrared sensor market. According to report the global infrared sensor market is projected to grow at a CAGR of X.X% over the forecast period of 2018-2024. 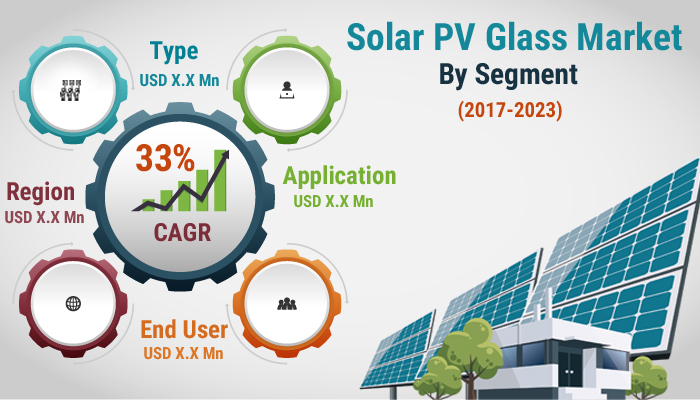 The report on the global solar PV glass market is an in-depth analysis of the segments and sub-segments in the solar PV glass market. The report provides analysis for the global as well as regional markets over the period of 2016 to 2024. According to the report the global solar PV glass market is expected to grow at a CAGR of 33% over the forecast period of 2018 - 2024. The global propane market was sized over USD 131.2 billion in 2017. 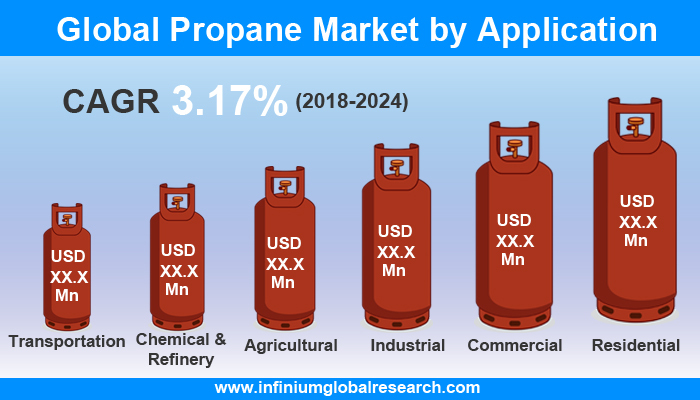 The global propane market is projected to grow with a CAGR 3.17% and 2.75% in terms of value and volume during the forecast period, 2018-2024 and reach USD 163.5 billion by 2024. The report on global shale gas market is an in-depth analysis of the segments and sub-segments. The report provides analysis for the global as well as regional markets over the period of 2016 to 2024. 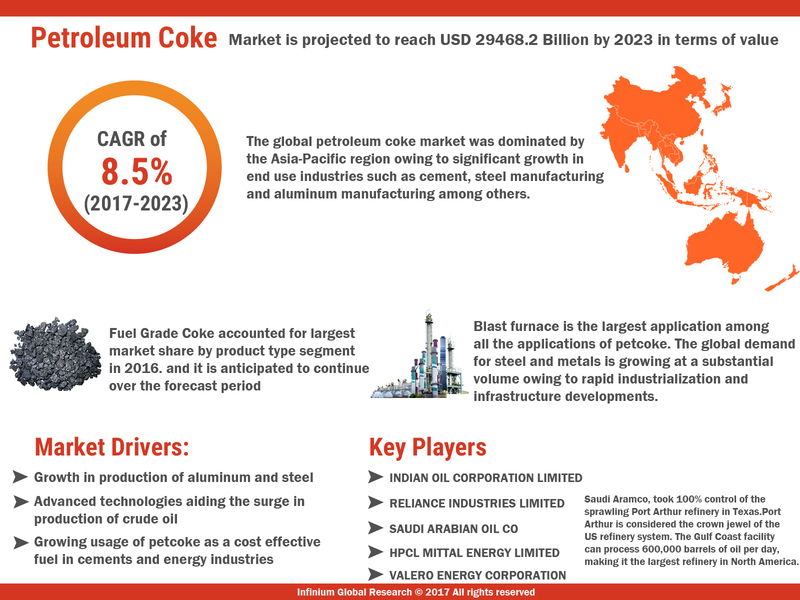 According to the report the global shale gas market is expected to grow at a CAGR of 13% over the forecast period of 2018 - 2024. The report on global shunt reactor market is an in depth analysis of the segments and sub-segments. The report provides analysis for the global as well as regional markets over the period of 2016 to 2024. According to report the global shunt reactor market is expected to grow at a CAGR of 4.46% over the forecast period of 2018 - 2024. The report on global specialty fuel additives market is an in depth analysis of the segments and sub-segments. The report provides analysis for the global as well as regional markets over the period of 2016 to 2024. 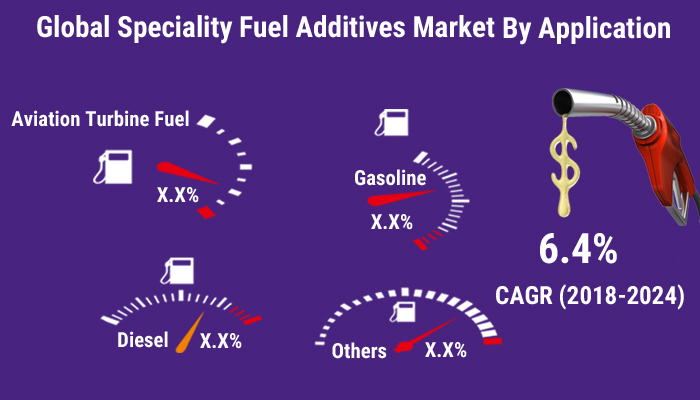 According to report the global specialty fuel additives market is expected to grow at a CAGR of 6.5% over the forecast period of 2018 - 2024. The report on global switchgear market is an in depth analysis of the segments and sub-segments. The report provides analysis for the global as well as regional markets over the period of 2016 to 2024. According to report the global switchgear market is expected to grow at a CAGR of 7.5% over the forecast period of 2018 - 2024. The report on global utility asset management market is an in-depth analysis of the segments and sub-segments. The report provides analysis for the global as well as regional markets over the period of 2016 to 2024. According to the report, the global utility asset management market is expected to grow at a CAGR of 8.10% over the forecast period of 2018 - 2024. The report on global microgrid market is an in depth analysis of the segments and sub-segments. The report provides analysis for the global as well as regional markets over the period of 2016 to 2024. According to report the global microgrid market is expected to grow at a CAGR of 16.5% over the forecast period of 2018 - 2024. The report on global oilfield services market is an in depth analysis of the segments and sub-segments in the oilfield services market. The report provides analysis for the global as well as regional markets over the period of 2016 to 2024. 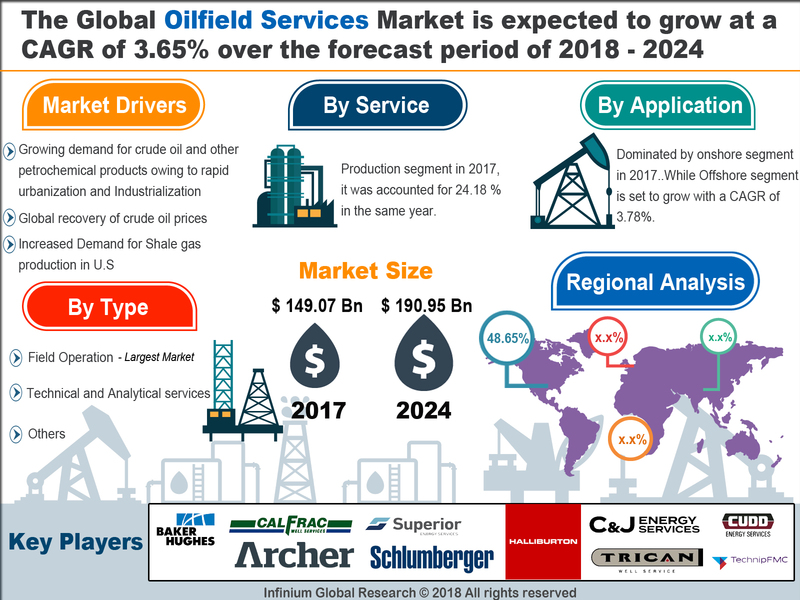 According to report the global oilfield services market is expected to grow at a CAGR of 3.87% over the forecast period of 2018 - 2024. The report on global perforating gun market is an in depth analysis of the segments and sub-segments. The report provides analysis for the global as well as regional markets over the period of 2016 to 2024. According to report the global perforating gun market is expected to grow at a CAGR of 3.62% over the forecast period of 2018 - 2024. The report on global portable filtration systems market is an in depth analysis of the segments and sub-segments. The report provides analysis for the global as well as regional markets over the period of 2016 to 2024. According to report the global portable filtration systems market is expected to grow at a CAGR of 3.82% over the forecast period of 2018 - 2024. The report on global high voltage cables & accessories market is an in depth analysis of the segments and sub-segments. The report provides analysis for the global as well as regional markets over the period of 2016 to 2024. According to report the global high voltage cables & accessories market is expected to grow at a CAGR of 5.3% over the forecast period of 2018 - 2024. The report on global hydraulic fracturing market is an in depth analysis of the segments and sub-segments. The report provides analysis for the global as well as regional markets over the period of 2016 to 2024. According to report the global hydraulic fracturing market is expected to grow at a CAGR of 7% over the forecast period of 2018 - 2024. The report on global low voltage motor control centers market is an in depth analysis of the segments and sub-segments. The report provides analysis for the global as well as regional markets over the period of 2016 to 2024. According to report the global low voltage motor control centers market is expected to grow at a CAGR of 5.55% over the forecast period of 2018 - 2024. The report on global micro turbines market is an in depth analysis of the segments and sub-segments. The report provides analysis for the global as well as regional markets over the period of 2016 to 2024. According to report the global micro turbines market is expected to grow at a CAGR of 9.38% over the forecast period of 2018 - 2024. The report is a comprehensive presentation of trends, forecast and dollar values of global photovoltaics market. According to report the global photovoltaics market is projected to grow at a CAGR of 17.5% over the forecast period of 2017-2023. The study highlights the impact of drivers, restraints and macro indicators on the global and regional photovoltaics market over the short term as well as long term. The report on global distributed generation market is an in depth analysis of the segments and sub-segments. The report provides analysis for the global as well as regional markets over the period of 2016 to 2024. According to report the global distributed generation market is expected to grow at a CAGR of 11.4% over the forecast period of 2018 - 2024. The report on global drilling waste management market is an in depth analysis of the segments and sub-segments. The report provides analysis for the global as well as regional markets over the period of 2016 to 2024. According to report the global drilling waste management market is expected to grow at a CAGR of 4.15% over the forecast period of 2018 - 2024. The report on global enhanced oil recovery market is an in depth analysis of the segments and sub-segments. The report provides analysis for the global as well as regional markets over the period of 2016 to 2024. According to report the global enhanced oil recovery market is expected to grow at a CAGR of 6.84% over the forecast period of 2018 - 2024. The report on global floating power plant market is an in depth analysis of the segments and sub-segments. The report provides analysis for the global as well as regional markets over the period of 2016 to 2024. According to report the global floating power plant market is expected to grow at a CAGR of 10.5% over the forecast period of 2018 - 2024. The report on global gas engine market is an in depth analysis of the segments and sub-segments. The report provides analysis for the global as well as regional markets over the period of 2016 to 2024. According to report the global gas engine market is expected to grow at a CAGR of 6.5% over the forecast period of 2018 - 2024. The report on global gas turbines market is an in depth analysis of the segments and sub-segments. The report provides analysis for the global as well as regional markets over the period of 2016 to 2024. According to report the global gas turbines market is expected to grow at a CAGR of 3.26% over the forecast period of 2018 - 2024. The report on global generator market is an in depth analysis of the segments and sub-segments. The report provides analysis for the global as well as regional markets over the period of 2015 to 2023. According to report the global generator market is expected to grow at a CAGR of 7.5% over the forecast period of 2017 - 2023. The report on global digital utility market is an in depth analysis of the segments and sub-segments. The report provides analysis for the global as well as regional markets over the period of 2016 to 2024. According to report the global digital utility market is expected to grow at a CAGR of 12.48% over the forecast period of 2018 - 2024.